Born in 1862 in Vienna, Gustav Klimt was born to become the most famous Austrian painter in the world. His works varying from paintings to murals, sketches and other objects of art revolved around the female body and were characterized by a sincere sensuality. Klimt’s most renowned work is The Kiss painted between 1908 and 1909, a golden period for the artist. The canvas depicts a couple embracing passionately, the man bending over the woman, whose eyes are closed as she awaits his kiss. The warm colors of the painting are adorned with layers of gold leaf, which enlighten it with a modern touch while reminding us of Byzantine mosaics that used gold backgrounds. The painting is now in the Österreichische Galerie Belvedere museum in Vienna, and is considered not only a masterpiece of the early modern period, but also a symbol of Vienna Jugendstil (Viennese Art Nouveau). 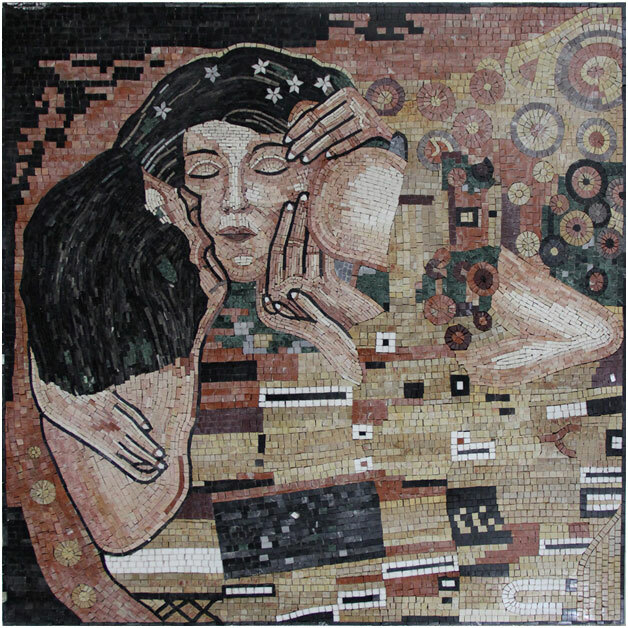 The exceptional painting can be found in a beautiful mosaic version at Mosaic Marble. The square representation focuses on the kiss itself, zooming on the passionate expression of the lovers and their sweet embrace. The marble mosaics used reproduce the feel and colors of the original in a unique way.